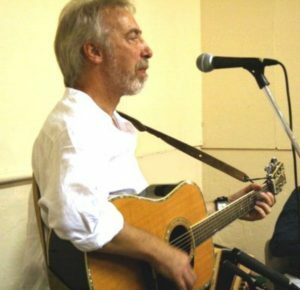 Pete works in a variety of fields – on the folk club and storytelling circuits and also with the general public at community events, in arts centres, libraries and schools etc. Pete is one of the few professionals on the English scene whose repertoire consists almost entirely of traditional English songs and ballads. The bulk of his material comes from the south of the country, as he does, and includes a number of songs from his native Kent. Pete has spent most of his adult life in the Midlands though, the last 30 odd years being in Derbyshire which he now considers home. He has an interesting repertoire of Derbyshire songs and, particularly, stories which very few other people do. Pete likes to include a few short stories in a folk club set but is willing to do purely songs if required. He finds it strange how scared some club organisers are of the idea of ‘storytelling’. It’s always been there as the between-song patter/jokes. Pete was always a storyteller—even before he started telling stories, because a lot of his songs are story songs or ballads but he’s worked specifically as a ‘storyteller’ since the mid 1980s. Pete’s storytelling is very accessible and is based in the folk tradition. He tells a mixture of traditional stories, tall tales, urban myths and extended jokes. He doesn’t do epics or myth cycles and is definitely not an actor putting on voices and costumes. Some of his stories are about or include music/song. He can tell stories to adults or children and particularly enjoys family audiences. Pete feels that he is at his best when he can do a 50:50 song:story set. The two forms go well together and give a unique view of the English folk tradition. A little delving (and not very deep) soon reveals that most of the old singers also told stories. If you’re lucky and the environment is right Pete could also put in a dance or two as well! This is the ideal choice for a non-specialist event. The general public really warm to and appreciate the mix of song and story. Pete also works as a community artist. This can just mean singing or storytelling with local groups—WIs, Over 60s etc or at village fetes but it can also be working on major, long-term projects. Pete has done several of these starting with A Village Song in Bassingham and working through the Mountsorrel Community Play and the Ethel & Ernest Project at Nottingham Playhouse to the Children of the Mills amongst others. Pete has usually been employed as enabler/songwriter/musician etc so he’s encouraged and helped groups of people to make songs to fit in with a larger community project, be it a play, an album or a performance. He really enjoys this kind of work despite all the headaches and heartaches it always seems to bring and would love to do more. 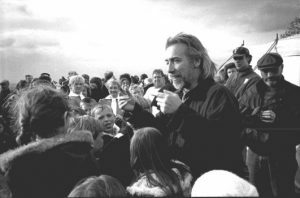 For children’s events in schools or libraries, at festivals etc Pete has a repertoire of songs, stories, dances and games suitable for most age groups. In the past he has done events all over country, sometimes solo and sometimes with various collaborators such as Keith Kendrick and, in the past, Lucy Castle and Bing Lyle. These sessions have varied from one-off ‘lessons’ in a school to longer term residencies. One of the most successful involved Pete and first Bing then Keith going into a particular school for a couple of days every year for about 10 years! This really paid off and, by the time it finished, the pupils had a huge rpertoire of songs and dances.